if you chose to include pork, get a pan with a little bit of oil nice and hot, and toss in the pork. make sure to do your best to keep it from curling up while it cooks. it is nice and thin, so i should cook quickly. when it gets close to done, add a little bit of soy sauce, black pepper, chinese hot pepper, and fresh ginger. place it in a bowl and pop it in the fridge to let it cool. add your chicken stock to a pot and bring it to a boil. once it gets there, add in the harusame. make sure to watch these bad boys, as they cook far faster than any pasta you have ever experienced. they aren’t flour based, so they won’t foam and froth and boil over. just stand over the pot, stirring gently, for a few minutes. try a noodle every now and again. your goal is to cook the noodles to the point of no longer being crunchy. they should be soft and slightly rubbery. when finished, drain off most of the chicken stock (you can leave a little bit) and put the contents of the pan into a metal bowl. add some ice, course salt, and water to a large metal bowl, and set the noodle bowl afloat in it. this process will chill the noodles while you prep the rest of your ingredients. add about a tablespoon of hot oil to the noodles along with a liberal dose of black pepper. toss to coat. you can use your hands if you like, just make sure not to burn yourself. the mass of noodles can still be pretty hot in the middle. tossing them will also help them cool faster. get out your cucumber, and slice off the ends. cut it in half, and then julienne like there is no tomorrow. you should end up with a pretty impressive pile of super thin shoestring cucumber. set it aside. peel the onion, cut it in half, and slice it as thin as you possibly can. the onions should be transparent they are so thin. set them aside as well. rinse your daikon sprouts, drain them of as much water as you can, and slice of the base. set them aside. when the noodles are nice and chilled, add in all of your ingredients (don’t forget about the pork if you chose to include it) and toss to make sure everything is evenly distributed. pile as much as you can on a huge serving plate. drizzle the salad with some of that sesame oil you have been waiting so patiently to use. top off the whole ensemble with some sesame seeds. eat till you can eat no more. eat a salad this light will fill you up, but it’ll leave you feeling spry and nimble (instead of bloated and sad). note: this salad keeps super well because of its lack of conventional dressing. pack up your leftovers in an airtight container and take them to work for lunch the next day. you’ll be the envy of the whole office. they are really a joy. you should see if you can find them at a local asian grocery. the are very close to devoid of calories as well, so they are a truly amazing diet food. the texture (when cooked just right) is also something the likes of which most people have never savored. more importantly, when produced properly, they are completely gluten free, making them an amazing alternative for people with celiac disease. I have seen them…aren’t they made of rice? I have had some Korean dishes with these noodle before. Love the texture! Thank you Misha. that’s where you have to be careful! 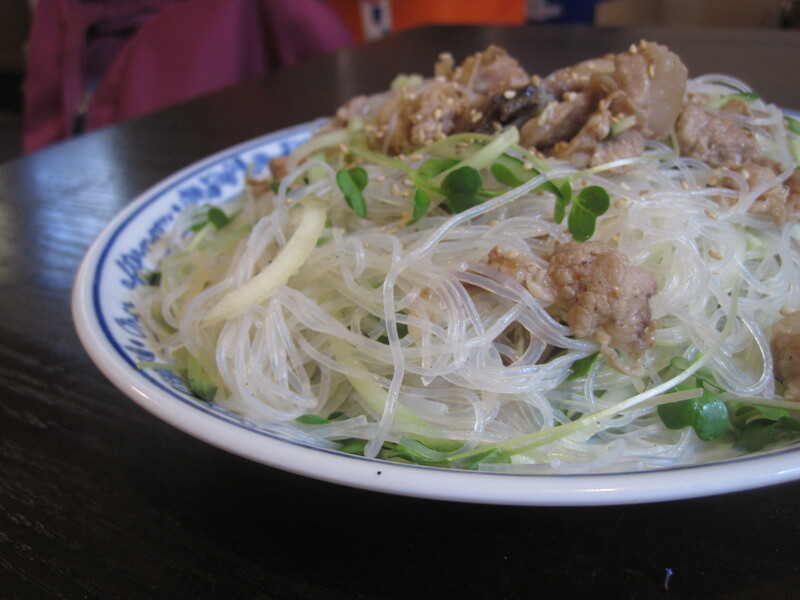 glass noodles are actually made from mung beans, while vermicelli-esque noodles made from rice are called bi-fun (pronounced bee foon). the easiest way to tell the difference is that bi-fun turn white when cooked, while glass noodles turn transparent.